"How terribley difficult was the fate of every soldier in this horrible war, and how little remembrance is there of the unknown soldier, of 'Everybody'". This sentence was written by a young corporal on 31 March 1945. The unknown soldiers who carried out the war acting under orders have not been the object of research in the past. Many do not even have a grave, their fate is unknown; there are hardly any traces accessible to the public. There are traces in the form of letters which were lost during the war or destroyed after the end of the war. 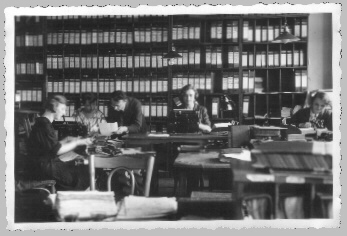 There are an estimated 120,000 to 150,000 war letters left of about 30 to 40 billion letters which were mailed during the Second World War by the German Postal Service. This shows clearly how much importance is attached to this evidence. Families consider them to be a treasure. Often nothing else is left of this particular family member. Biographical data are hardly ever available on the authors of the letters in public archives, although family members could still be interviewed. This makes scientific research relating to these significant documents difficult. The dissertation focuses on the archives situation in Germany and how it can be promoted. Medium of communication. With regard to the "Third Reich" media science has focused so far on mass communication. War letters can be seen under the viewpoint of communication of the masses. They are a medium which established a fine information network between the soldiers and their relatives over the entire area of operation, occupation and home country. Other disciplines have already dealt with this medium as scientific source. The heterogeneous state of knowledge and the many problems in dealing with the letters are explained in the dissertation and brought to a coherent standard. Present knowledge and documentation is coordinated in order to develop interdisciplinary methods on this basis. This work should not only be point of departure for source utilization by the media science, but also offer an opportunity for other disciplines to use this source. For the first time war letters are investigated from the viewpoint of communication and media science. Their history and conditions of origin and communication are described and war mail is defined in a differentiated manner. Thus it is possible to do scientific research on this topic. Relevance. Although soon after the end of World War II research started to focus on the details of the events not all questions have been answered satisfactorily. The figures are correct but the accounts still have to be settled. The individual is an unknown variable in the war. Open questions remain and they must be seen against the background of the problem of the involvement of the "unknown soldier" and of the terrifying stability and efficiency of the totalitarian system. The findings on anonymous figures and data permit questions as to the individual. At the time of the nuclear arms race, the Cold War, and a strong peace movement in Germany the question of the German population's involvement in the Holocaust and in the war was discussed in general and in the media [The TV series "Holocaust" broadcast by the WDR at the beginning of the 1980ies. Cf. Friedrich Knilli and Siegfried Zielinski (Eds. ): Betrifft: "Holocaust". Zuschauer schreiben an den WDR, Berlin 1983].1982 the anthology "Das andere Gesicht des Krieges" was published by Ortwin Buchbender and Reinhold Sterz which for the first time presented war letters for scientific research. It showed voice and face of those Germans who actively participated in the war. Four years later they were still "an undiscovered historical source" as Peter Knoch stated. It took more than ten years until they were rediscovered for scientific use. It will be investigated whether questions which have been asked since the 1980ies can be answered. The first section presents a historical overview (Chapter 1) of the source, followed by the communication conditions under which the medium "war letter" emerges: the social context of pre-war and war time of the civil population (Chapter 2.1) and the soldiers (Chapter 2.2), the various official events in chronological order (Chapter 2.3) and the conditions of forwarding the war letters (Chapter 2.4). In the last-mentioned chapter a differentiated definition of terms of the scientific object of investigation "war letter" (Chapter 3) is undertaken. The following section illustrates the state of sources in Germany (Chapter 4) and the state of documentation and research (Chapter 5). The results are interlinked and brought to a uniform standard. Desiderata are stated. In the last and third section open research problems are discussed in an interdisciplinary way (Chapter 6). Conventional and new computer-aided processes for scientific evaluation of the source (Chapter 7) are introduced. The possibility of reaching statistical representativeness is developed. A catalogue system for archives and computer-aided access is elaborated (Chapter 7.5). This system takes into consideration the context, the definition, the situation of stocks, the research problems of various disciplines and the different possibilities of access to the source. Thereby an instrument is created which serves scientific and systematic investigation. Basis for a systematic collection. The dissertation shows that on the basis of topical questions put to the war generation and the systematic collection of the documents from the Second World War it is possible today with the aid of modern EDP to investigate the contents of the war letters and to promote the situation in the archives. However, quick action is necessary: More than half a century after the end of the war the war generation is dying out. Their letters and documents are often thrown away or are sold because of the stamps. Their contents is lost for ever for scientific use. The survivors of the war generation have to be interviewed as to decisive data on the authors and recipients of the letters. Such a data collection does not exist in Germany and cannot be reconstructed for existing collections. It is however of decisive importance for scientific use. The necessity for new collections more than 55 years after the end of the war is due to insufficient stocks in Germany and due to the possibility of starting collections in East Germany today, which has been possible for only about 10 years. Research should answer the question as to what is worth being collected: as long as questions are put to the war generation, each part of its heritage which provides information on its mode of thinking, feeling and action should be of significance to public archives. A tool for handling the collected material is a data bank whose development is dealt with in this dissertation. Basis of interdisciplinary research. The non-uniform use of terms in connection with the source, above all the unclear use of the terms "censure" and "war letter", has led to an uncoordinated situation of research. In this work a uniform state of research and a comparison of documentation and stocks will be undertaken. Conventional methods of different disciplines are considered and new computer-aided methods are presented. Thereby the basis for coordinated inter- and transdisciplinary research is created which aims at an interdisciplinary, constructivist conception of history. Basis of an interdisciplinary conception of history. In the media a self-description of society takes place. It constructs and consolidates reality. If it is accepted that private or official messages transported via individual and mass media form a circular system in which messages are interrelated, theories become obsolete which are based on linear, dualistic and causal models. As regards the war letters they are no longer interpreted in the sense that not only military events have influenced the soldiers and authors of letters but that the soldiers as a whole have influenced the military events. The same is true of the interrelationship between the soldiers and their relatives. Here processes are concerned in which reality is created by individual perception of the other person, his messages and of his own environment. The description of one's perception, opinions and actions constitute reality. A constructivist conception of history sees the reality of historical events as a cycle of different perceptions which create realities which again constitute perceptions. Caesuras of military policy become diffuse, the individual and social context contributes to this. History is made up of stories. Such an approach prevents a too scientific approach to this source of everyday life. Perspective. This work shows that an interdisciplinary approach and transdisciplinary cooperation among different disciplines is symbiotic. War letters as a source offer the chance of an exchange among different disciplines. The procedure of interdisciplinary science management based on division of labour and exchange of opinions will promote research in this field. It is based on a transparent use of the source and an interdisciplinary conception of history. "All human delusions have their limitation, and this has been reached now", writes Heinrich Böll on 3 April 1945 to his wife. How much this limitation is still a topic shows the interdisciplinary interest in the documents of war. This work facilitates interdisciplinary understanding and overcomes the barriers in connection with the deficits in stocks. The occupation with borderline experiences of the Second World War remains of topical importance as long as the "delusions" which are not only reflected in Böll's war letters are topical.